desmoinesdem: "Best Chick Pea Recipe Ever"
thanks to demoinesdemm for this great recipe!!! Here's one more for those who are vegetarian or just trying to cut back on meat. 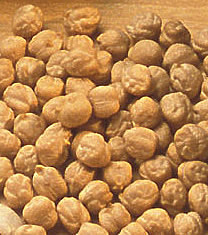 Chick peas are a good source of protein, especially when paired with a whole grain. In the mid-1990s, I lived in Prague for three and a half years. I got tired of bland food and started learning to cook Indian food. This was one of the first recipes I tried. I used to cook it on Sunday and eat it for lunch at work for the next few days—it keeps well. This is also good for potlucks, because it contains no dairy, eggs or meat that could spoil if it sits out for a while. I have adapted the recipe on the assumption that you are going to use canned chick peas. If you like to soak and cook your own, start with one and a half cups dry chick peas, soak overnight, drain, and cook for a few hours without salting the water. Put 2 tablespoons of chopped onions, a little salt, the green chile, ginger and lemon juice in a teacup. Mix well and set aside. Heat oil in heavy, wide saucepan over medium-high heat. When hot, put in remaining onions. Stir and fry for 10-20 minutes or until the onions get reddish-brown spots. Note: in Indian cooking you almost always need to saute onions past the light golden brown stage. Add tomatoes, stir and cook for another 5 minutes or so, mashing the tomato pieces with the back of a spoon if they are not small enough for you. Add cumin, coriander and turmeric, and stir for about 30 seconds. Add some water (from one-half cup to 1 cup, depending on how much sauce you want with the dish—I usually add about three quarters of a cup). Add drained chick peas, remaining salt, garam masala and cayenne, if using. Stir, bring to a simmer, then reduce heat. Cook covered, very gently, for about 20 minutes, stirring a few times during this period. Stir in the mixture in the teacup just before serving. Can be served hot or at room temperature. Now, you can just eat this in a bowl with a spoon, or serve it over plain rice, cous cous or bulgur wheat. Or pick your favorite rice pilaf—any decent Indian cookbook will have several good ones to choose from. Here's a rice dish I like, which is not hard to make and has a subtle flavor that goes well with the strongly-flavored chick peas. If you use brown basmati rice, you'll want to get the rice going first, then make the chick pea dish while the rice is cooking. Maybe Jen can explain how to make a dish like this in her rice spaceship. I use a heavy iron pan with enamel on the inside—cooks well, easy cleanup. These directions assume you are using brown basmati. If you use white rice, the cooking time will be shorter and you may have to reduce the amount of water. Wash basmati rice and soak in cold water in a bowl for about 30 minutes. You may find some hulls or black grains, and these should be thrown out. Drain and set aside. Gather all the other ingredients and have them ready next to the stove. Heat oil over medium heat in heavy-bottomed pan with a tight-fitting lid (if your lid doesn’t have a tight fit, try placing a sheet of aluminum foil across the top and then putting the lid on when the time comes). When oil is hot, add all the spices except for the ginger and fry for 1-2 minutes. Add the drained rice and cook, stirring constantly, for about 2 minutes. Add 3 cups water, ginger and salt, stir well, and bring to a boil. When the water boils, stir again, cover, and reduce heat to low. Important: do not listen to anyone who says you need 4 cups water to cook 2 cups of rice. You’ve already soaked the rice, so you want a ratio of 1.5 cups water per 1 cup of rice. If you use white basmati, you may need even less water, but I am not sure about that. VERY IMPORTANT: DO NOT PEEK ONCE YOU HAVE REDUCED THE HEAT. You need to keep the lid on the whole time to cook the rice properly. You want the rice to keep simmering, but just bend down and listen for bubbling rather than lifting the lid to see if it is still simmering. After a few tries you will get to know your stove and what level of heat is appropriate. After about 30-40 minutes, or when you can’t hear any bubbling when you bend down close, turn off the heat but KEEP THE LID ON for another 10 minutes or so. If you leave the pan undisturbed, the rice will stay warm for at least a half-hour. Remove the whole spices before serving. Reheats well for the next few days.